The Citroen company has updated 2017 Citroen C4 Picasso, as well as its seven-seater modification 2017 Citroen Grand C4 Picasso. Restyled versions have received a modified front part of the body, tail lights with 3D effect, 17-inch alloy wheels and an extended color palette. The motor scale of 2017 Citroen C4 Picasso enriched with 1.2-liter engine of a family PureTech. This engine works in conjunction with a six-speed mechanics and develops 110 hp. Also, for both models became available 130-horsepower engine of a similar volume that is mounted in a pair of 6-band automatic. The updated compact van 2017 Citroen C4 Picasso is now available for order with two-tone roof, and for the seven-seat 2017 Citroen Grand C4 Picasso is offered with silver roof side pillars. The palette of available colors for the models enriched with three new tones: Wild Blue (blue), Dune Beige (beige) and Hype Grey (gray). Five-seater and seven-seater 2017 Citroen C4 Picasso also received several new electronic assistants: Active Cruise Control with Auto Brake, Blind Spot monitoring system, collision warning and emergency braking. 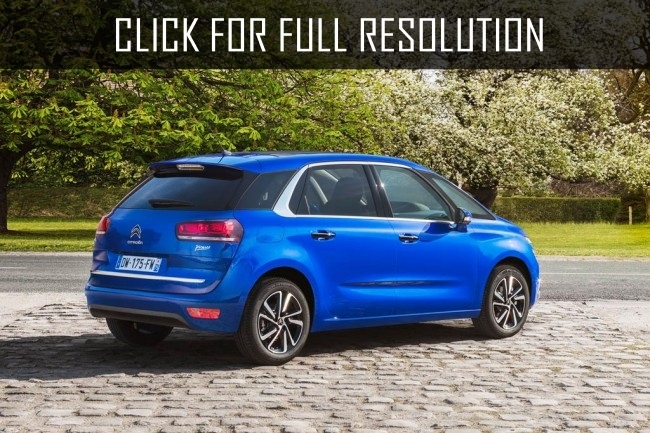 Restyled 2017 Citroen C4 Picasso and 2017 Citroen Grand C4 Picasso have equipped with the new version of multimedia system with the 7.0-inch display, DAB radio and a set of the modern navigation charts. Note that you can control the navigation control by using voice commands. World premiere of new products will take place at the Paris Motor Show in 2016, and their European sales will start in September. Information on prices is not.